More than a million illegal immigrants are unlikely to ever be removed from Britain, MPs have heard. The assessment was issued by a former senior official, who also suggested the Home Office would struggle to meet the challenge of Brexit without a boost to resources. David Wood, an ex-director general of immigration enforcement, told the Commons home affairs committee there are "enormous difficulties" in removing overseas nationals who are in the country unlawfully. He said: "There's probably over a million foreigners here illegally at the moment. There's a large number, so no-one could ever remove those really. "But what there needs to be is a consequence, there needs to be seen that there is a risk that if you don't abide by the immigration rules, and you overstay or you commit crimes, there is a consequence and a real risk of being removed." Official statisticians have said it is impossible to accurately quantify the number of people in the country unlawfully. In an estimate 12 years ago, a Home Office assessment put the total unauthorised migrant population living in the UK in 2001 at 430,000. A report published earlier this year by think-tank Civitas suggested that illegal immigration is running at a minimum of 150,000 a year. This would include those who remain in the country beyond the period allowed under their visas, or after asylum claims are rejected, as well as people who arrived with no legal entitlement in the first place. The main count used to track trends in regular immigration is net migration, which is based on a survey of passengers and measures the difference between the numbers arriving in and leaving the country for at least a year. The committee is examining the capacity of the immigration system to cope with the challenges posed by Brexit, including the task of documenting more than three million EU citizens currently in the country and preparing for a new post-departure regime. Mr Wood, who retired from the Home Office in 2015, said: "Right across the immigration system, I don't think it was ever greatly well resourced and it's becoming tighter and tighter. "I don't think under current resources that the challenge of Brexit can be met, and certainly not met smoothly." He added: "It's no good thinking in two years time that we suddenly need 2,000 staff. The staff have to be trained." Mr Wood suggested it could take as long as 12 months before the impact of any attempt to increase the workforce was fully felt, given the "bureaucracy of recruiting into government". He said: "If you decide today 'I want a hundred staff', the reality is you won't have them for at least six months." 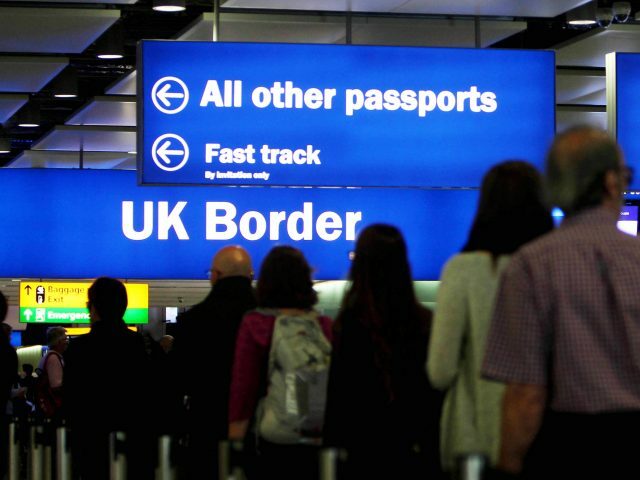 John Vine, a former chief inspector of borders and immigration, described the bureaucratic task facing the Government as "unprecedented" and said it would require a "considerable" increase to staffing levels. Figures for 2016/17 show Border Force, UK Visas and Immigration, and Immigration Enforcement had 7,670, 6,467, and 4,969 full-time staff on average respectively, which were all down compared with the previous year.